New stamps featuring inspirational quotes from famous South Africans were recently launched at the Design Indaba in Cape Town. 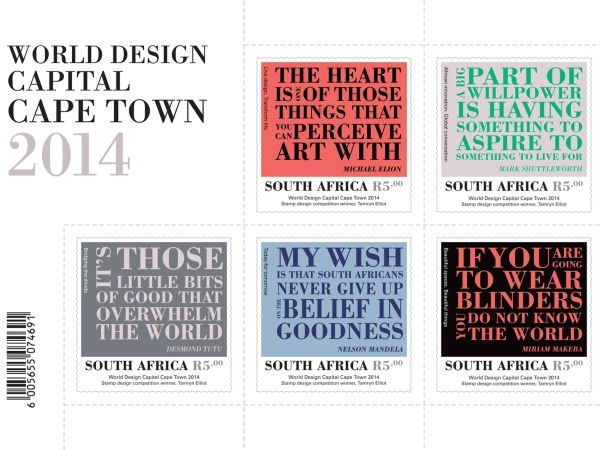 New postage stamps featuring inspirational words from famous South Africans were launched today to celebrate Cape Town being the 2014 World Design Capital (WDC2014). “The concept of my stamp design is to inspire fellow South Africans to greatness through the words of well-known South Africans from history,” Tammy Elliot, first prize winner of the South African Post Office stamp design competition for WDC2014, says. She used quotes from well-known South Africans like Nelson Mandela, Desmond Tutu and Mark Shuttleworth in her stamp design. The stamps, which will have a limited run, are available at local post office branches and form part of the official WDC2014 programme. “I trust that these stamps will travel all over the world to portray African ideas that speak to every nation,” Nicky Swarts from WDC2014 says. Cape Town was named as WDC2014 at the International Design Alliance (IDA) Congress in October 2011 in Taipei. It’s the first African city to be named design capital. Previous winners include Helsinki, Seoul and Turin. The WDC2014 programme seeks to transform and better the city of Cape Town through design.